Somers Point undoubtedly offers a lot of restaurants. But Raffael Kupa saw a niche that he could fill. 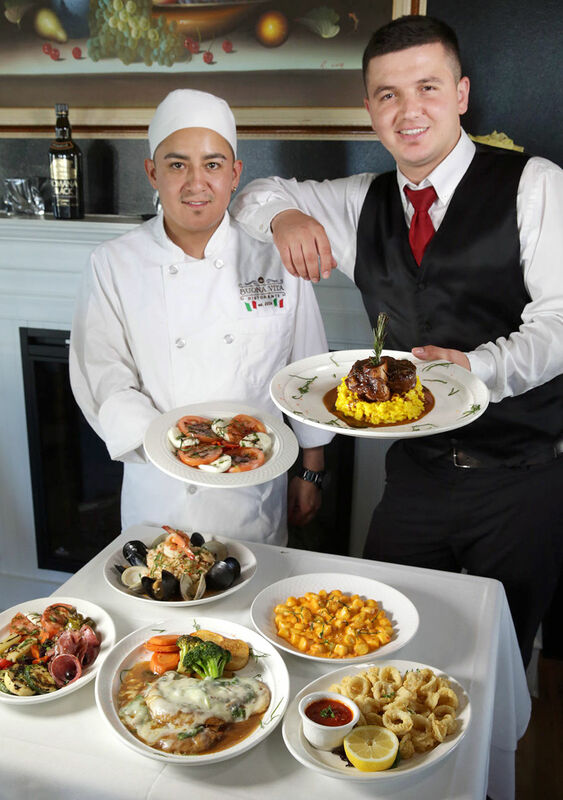 Kupa has been providing authentic Italian food in a BYO setting as the co-owner and co-founder of La Fontana Della Citta in Philadelphia since 2006. And while Somers Point had its share of Italian options, Kupa’s vision would raise the bar. So he opened Buona Vita in the former Latz’s by the Bay location on Bay Avenue over the winter. Since then, it has been the buzz restaurant of the town. All appetizers are under $10, including PEI mussels ($7.95) with peperoncino, oil, garlic, white wine or tomato sauce; light fried eggplant ($8.95) stuffed with whipped fresh ricotta cheese, topped with fontina cheese and finished with marinara; and the antipasta ($9.95) with tomatoes, fresh mozzarella, roasted peppers, prosciutto di Parma, marinated olives, grilled veggies and aged balsamic. Four salads are under $9, including the popular roasted beet ($8.95) with mixed greens, toasted almonds, gorgonzola dolce and raspberry vinaigrette; and the homemade pastas are all under $20. Of the pastas, do yourself a favor and get the homemade potato gnocchi ($17.95) in your choice of marinara, gorgonzola or aurora — or ask for a sampler plate of all three. The pappardelle is also homemade and is stellar served with Buona Vita’s bolognese ($18.95). The huge menu also features a variety of seafood pastas, including the Fettuccine Buona Vita ($23.95) with homemade spinach fettuccine tossed with jumbo crab, grape tomatoes, basil, garlic, olive oil and white wine; seafood dishes such as langoustines (market price), large Mediterranean grilled shrimp with olive oil and a a fresh squeeze of lemon. Of course, Buono Vita has its share of meat dishes, such as its famous Vitello Buono Vita ($25.95), veal medallions topped with prosciutto di Parma, smoked mozzarella, imported porcini mushrooms and brown veal stock reduction, as well as their veal ($20.95) and chicken parm ($18.95) made with Buona Vita’s equally popular tomato gravy. One problem Kupa keeps having is the inability change specials because people like the current ones so much including fresh branzino served whole or filleted with artichoke hearts, lump crab, grape tomatoes and a lemon-wine-caper sauce over cappellini, as well as veal osso buco. Desserts, including creamy, light tiramisu, tartufo, crème brulee, panna cotta and cannoli, are made in house, adding to the authenticity. How much: Appetizers range in price from $7.95 to $9.95; salads $7.95 to $8.95; pasta $16.95 to $19.95; pasta with seafood $17.95 to $25.95; fish $18.95 to $21.95; meats $20.95 to $25.95; kids menu $8.95; desserts $6.95 to $8.95. Services: Major credit cards accepted. BYO. Disabled access via ramp to front door. Eat in. Takeout. Outside dining available. Private parties. Catering. Kids menu. No smoking. More info: Call 609-788-0370 or go to BuonaVitaRestaurant.com. Between you and me: Buona Vita looks nothing like the former restaurant that occupied the space. All of the interiors have been re-done with new decorations and color scheme, and the porch on the front and patio in the back offer al fresco dining.